How are windows installed in a wooden house? 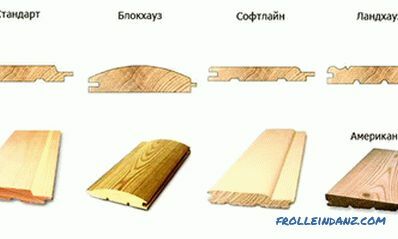 Currently, when building houses made of wood, installation of plastic windows is often carried out in them. The process of installation of glass in the future may be complicated if the installation does not take into account the features of buildings made of wood. Houses made of wood, for many years shrink. The settling of a house made of timber or log, unlike a concrete house, lasts for the entire life of the building. When installing window openings, please note that the wooden house settles after a certain time. When installing window openings it is necessary to take into account the shrinkage of the wooden house. A wood house shrinks. The greatest subsidence of the structure occurs in the first year after the construction of the house. In the next 5 years there is a strong shrinkage of the log house. Sometimes in some regions such shrinkage lasts the entire life of the house. 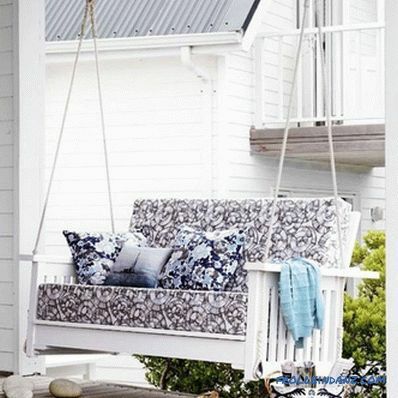 When sitting on wood, the height of the house can be reduced to 1.5 cm per meter of construction. Thus, the height of the building can be reduced by 6 cm. With the usual installation of plastic windows, a gap of no more than 2 cm is left. 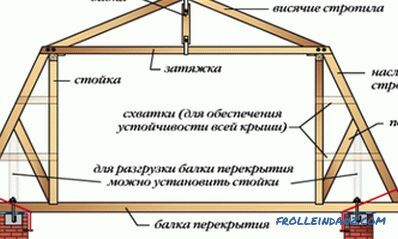 Nevertheless, the installation of plastic products in a wooden house is possible thanks to the construction of a special product called an ossyachy. This design is intended to make the window structures independent of wall shrinkage, to prevent any load on the frame during deformation of the load-bearing walls. 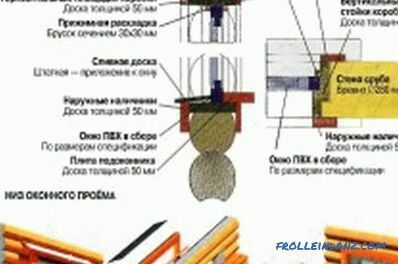 strengthens the wall of the building in the area of ​​the window. The simplest construction of the casing is performed as follows. 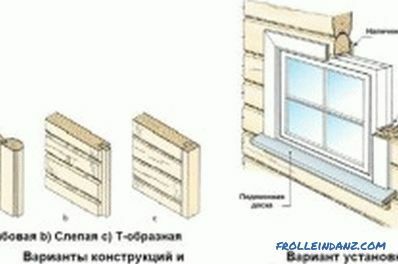 Make a vertical groove at the ends of the logs of the window opening, which has a size of 50x50 mm. In this groove set the bar of the same size. This method of installation casing used in the installation of wooden windows. When installing plastic structures, use a more advanced method of mounting the okosyachki. At the same time, at the ends of the logs, a special comb is cut out, onto which a carriage with a groove is worn. In this case, during the shrinkage due to the presence of the ridge of the board will move inside this groove. However, they will not deviate from the vertical position and thus will not press down the window. 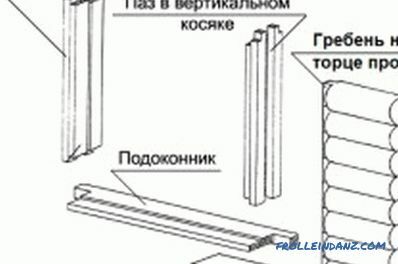 In some designs, okosyachki groove is made in the log, and the spike is performed on the window rail. The carriage is a vertical bar having dimensions of 150x100 mm. At the ends of this bar, special cuts are made with dimensions of 50x50 mm, which are designed to install horizontal wooden lintels having dimensions of 150x50 mm, which have special spikes at the ends. Okosyachka in finished form is a product that has dimensions smaller than the window opening by 8 cm vertically. This distance must be left in case of shrinkage of the wooden wall. In the manufacture and installation of the casing in the window opening, it is necessary to wrap the ridges with tow and to install window carriages on top of it. Due to this, thermal insulation of the structure occurs, and the walls will not creak during shrinkage. 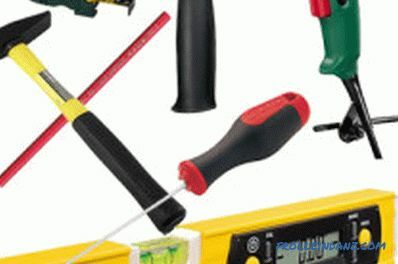 Tools for installing windows: building level, screwdriver, hammer, screwdriver, measuring tape, pencil. 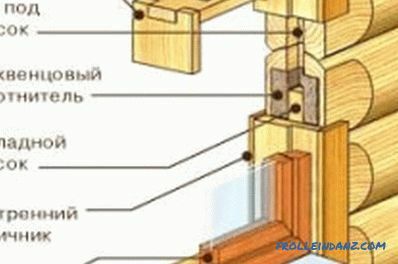 How to install windows in a wooden house? First of all, in the wall cut out the window opening. The distance from the floor to the window sill should be 80 cm. Such a distance is chosen so that a person can comfortably rest his hands on the window sill. Standard tables in the room are about 80 cm high. The window sill should be slightly higher than the table tops. It is necessary to take into account the thickness of the foam layer, which is 2 cm and the thickness of the window sill 4 cm. After that cut out the opening. Using the building level, marks are made to draw horizontal lines. Then, using a plumb line, the vertical lines of the future structure are drawn. First, hold the bottom line of the opening. Then mark the top line. The height of the opening for the installation of double-glazed windows must be 14 cm higher than the frame size. This is because from the lower border of the opening to the window frame 4 cm are left for the installation foam and the window sill, 4 cm for the casing and 5 see the shrinkage of the building above the frame. Vertical lines are drawn with a plumb line. The opening should be 12 cm wider than the size of the glass unit. At the same time, 1 cm on each side is left for the foam, 10 cm for the casing. After that, with the help of a building level and a plumb line, horizontal and vertical lines are checked. This is necessary to avoid skewing the structure. Installation of a window in a wooden blockhouse. Then install the lower jumper. Then make the comb. The crest is wrapped with tow, they are put on carriages. After that, install the upper gap and fix the upper jumper in the grooves. The completed construction is fixed with self-tapping screws. It is necessary to observe special care. In no case can not fix the comb, because because of this can all work on the installation of okosyachki come to naught - it will not perform its functions. In the grooves between the logs and the casing stack roll tow. Then install plastic products into the prepared casing. Shrinkage of the house will not cause the destruction of the frame. After that, thin boards are laid into the gap between the osyachyka and the logs of the walls, after having enclosed them with roll tow. After some time, when there is a noticeable shrinkage of the walls, these boards are removed and replaced by others. The upper casing, which is attached only to the okosyachka, is removed. Then carry out the replacement of thin boards and roll tow. After that, the upper casing carefully set in its place. This completes the installation of glass in a wooden house. At installation of windows in the house from a felling or a bar the technology of performance of work described above is strictly observed. 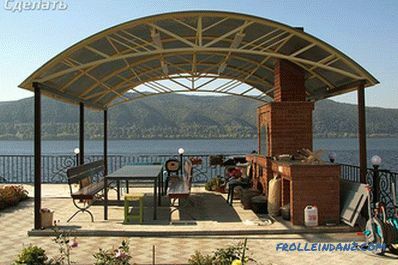 The main thing in assembling is to equip the structure with an oosyachkoy, which will prevent the negative impact of the shrinkage of the building from wood. Installation of windows in a wooden house: view from above and below. How to replace windows in a wooden house? Often there is a need to replace old wooden windows with plastic windows in the house. To do this, remove the old products. Then remove the trim to perform the necessary measurements. 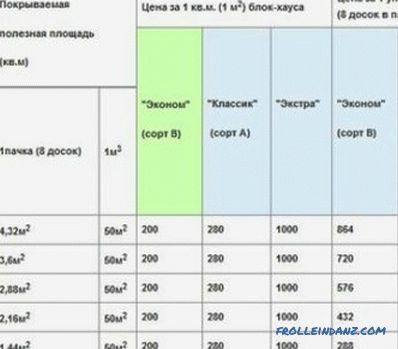 In the presence of cassation replacement of products is easy. But there are such cases when there is no roundabout. When installing wooden windows are often similar cases. In such conditions, the window opening box plays the role of a casing. In this case there are 2 options for mounting plastic windows. The first option: install smaller items. 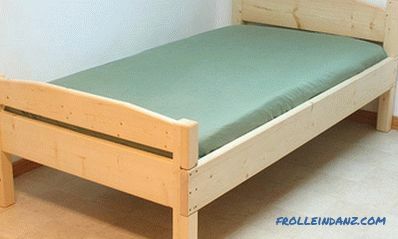 But it is necessary to significantly reduce the size of the frame. During installation, it will be necessary to add the thickness of the frame, the size of the awl, the thickness of the foam layer to the size of the future window. Then the window opening will significantly decrease in size. Pick up the design of glass will be quite difficult. Therefore, in such cases, they usually resort to the second mounting option: they rework the opening for the installation of an okosyachka. After that, installation of a window in a wooden house is carried out according to the above technology. In no case should the manufacture of windows in a wooden house be performed without casing. 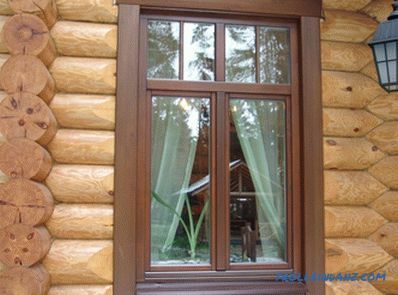 Only high-quality installation of windows in the presence of an okosyachki will be strong, reliable and durable and preserve the design features of a wooden house. How to install the house block? Information on how to lay a block house: do it yourself installation. Materials and tools designed to work. Technology phased execution of work. Design and decoration.